Aunt Margaret Simpson (Aunt Mar) and her niece, Sharron arrived on January 23rd and left the morning of the 27th. It seems as though our time together flew by, way too quickly. Aunt Mar really isn’t our blood relative, but we couldn’t be closer to her or love her more if she were. 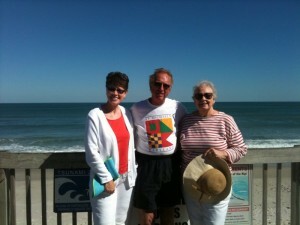 When Gary was sick in 2000, Aunt Mar helped with his nursing care and we have been the best of friends ever since. She flew into Charlotte, North Carolina and Sharron drove up from Columbia, South Carolina to pick her up at the airport. 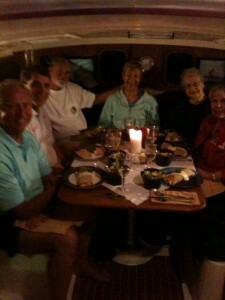 The next day, the two of them drove all day to get here at Indian Harbour Beach to visit with us aboard White Swan. They comfortably stayed at the hotel which is just a block away from our marina and visited with us during the day. We were excited about introducing them to our friends here at the marina, so a dinner party was one of the first things on the agenda. Whenever we have a dinner party on White Swan, it’s always a tight squeeze for everyone to sit around the table, but we always manage and no one seems to mind because it’s so much fun. For dinner I made shrimp crepes and salad and a hot berry crepe for dessert. Our friend, Jean Louis Evenou, who owns Cafe Normandie, a French restaurant in Annapolis, Maryland, taught me how to make crepes and every once in a while I like to prepare them for guests. Guests never seem to mind that I take advantage of them in this manner. 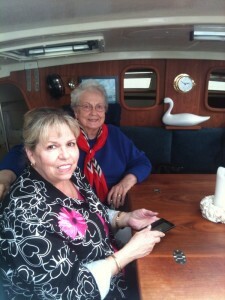 Aunt Mar and Sharron enjoyed the afternoon we spent sailing on the Indian River. The wind was 12 to 20 mph making it a good day for a sail. The Indian River is approximately two miles wide in this area and stays deep almost the whole width, which is good for sailing. With the wind as strong as it was, we sailed the width of the river in a short period of time requiring many tacks. Aunt Mar and Sharron were impressed with Captain Gary’s sailing skills. We went to Ed and Cheryl Byers’ (our new friends who have a Gemini catamaran like ours, in the boat slip next to ours) house in West Melbourne, Florida to watch the Colts win their second game of the playoffs, forwarding our team on to the Super Bowl. Yeah, COLTS!!! We cheered them while “grazing” on refreshments and I feebly multi-tasked doing the laundry while watching the game; forgetting about the laundry until someone would use a key word in their conversation like, “They’re all WASHED up.” Or, “We are really taking them to the LAUNDRY.” It got to be rather amusing when I’d jump up and say, “Laundry!” and go running to the laundry room to throw in another load. You had to be there to really appreciate the humor of it. No trip to Indian Harbour Beach can end without a visit to the ocean. Since the ocean is only one mile from the marina, it’s easy to frequently go there. The ocean’s majestic waves and the blue skies as her backdrop never cease to charm people as her sound magically lulls them into her mesmerizing presence. Aunt Mar didn’t want to leave and we didn’t want her to go. Her husband back in Indiana, Uncle Marion, was generous to share her with us, even if the time was too short.